Twin Size: 20 In. (W) x 44 In. (D) x 42.25 In. (H) The angle part of the stairs is 5-1/2 Ft.
Full Size: 20 In. (W) x 59 In. (D) x 42.25 In. 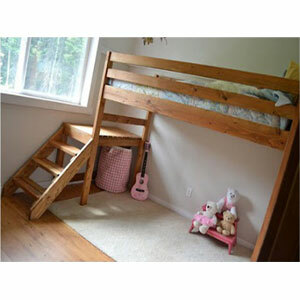 (H) The angle part of the stairs is 5-1/2 Ft.
Queen Size: 20 In. (W) x 65 In. (D) x 42.25 In. (H) The angle part of the stairs is 5-1/2 Ft. The Weight Capacity of this Unit is 300 lbs. We can also make it extra tall or custom sizes. Guard Rails and Staining is available at additional cost. Please enter the Stain Color of your Stairs. Click below for information about our Stains. We can apply a coat of Mineral Oil to the bed to protect and bring out the natural color.To indicate your choice of color, please enter it in the comment section at checkout.